We are delighted to announce a new Heritage Site at Phillipskop Mountain Reserve near Stanford, due to the recent discovery of rock art in our cave – the only recorded rock art on the Cape Whale Coast! This rock art site will be opening to the public on 1st December 2016. 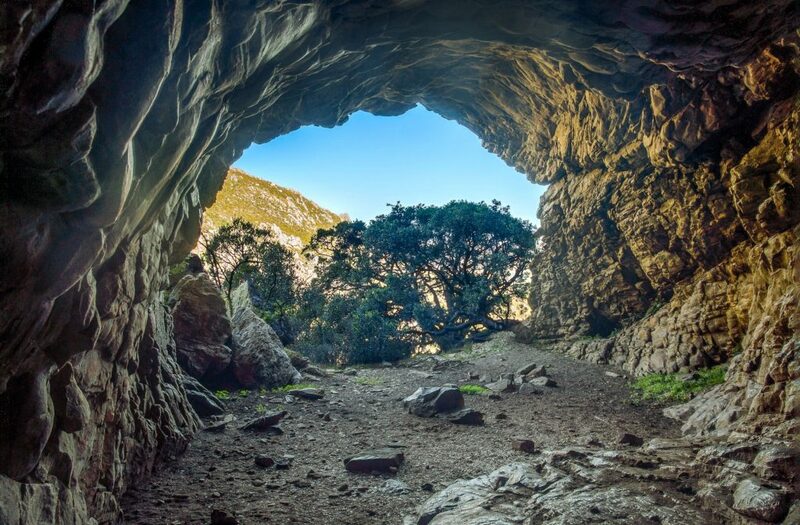 Cave paintings were discovered in the spacious cave at Phillipskop Mountain Reserve earlier this year, and since then we have been working with archaeologists and Heritage Western Cape to investigate and record the rock paintings, and put together a management plan to care for it. 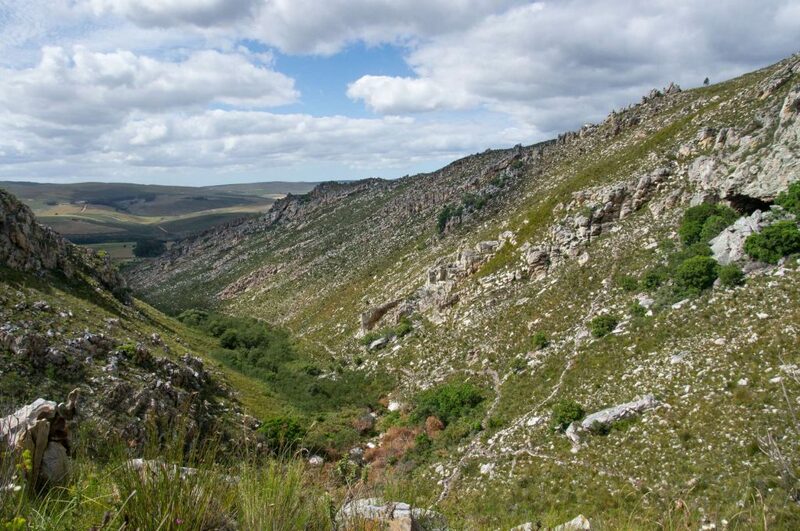 Heritage Western Cape has designated the site as a Grade IIIA Heritage Site (High Local Significance). 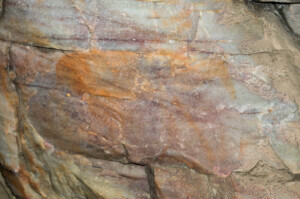 Phillipskop rock art site is special because it is currently the only recorded rock art on the Cape Whale Coast. 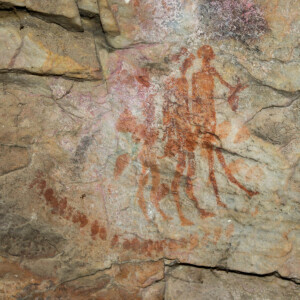 The paintings, which depict a group of men, an antelope, and various decorated hand-prints and finger dots, represent both the San hunter-gatherer and the Khoe herder traditions which began thousands of years ago and persisted into early colonial times. This rock art not only reflects the life of the past, but also the cultural conceptions of the artists, and it is of important historical, cultural and educational value. The rock art is situated in a large, sheltered cave, near a stream – an ideal shelter for San and Khoe people. It is thought that the decorated handprints and finger dots are the work of Khoe pastoralists, and are approximately 1,000 – 2,000 years old. The fine-line human figures and antelope paintings represent the work of San hunter-gatherers, and are likely to be significantly older. Although there are many thousands of rock art sites in Western Cape, the majority of these are clustered in areas such as the Cederberg. Rock paintings in the Overberg are very rare. 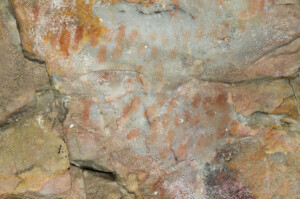 The rock art at Phillipskop extends the known geographical range of Khoe-San paintings. 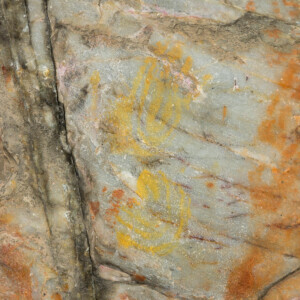 Phillipskop’s rock art site is situated in a cave, a 2km walk from the reserve’s reception and carpark. The Waterfall Hiking Trail takes you to the foot of the slope up to the cave. There is a short but steep path up from near the waterfall; good shoes and steady feet are advised. The reserve is open every day, 8am-5pm. There is a day visitor entrance fee of R40 per adult and R20 per child and the walk can be combined with longer hiking trails. Directions from Hermanus or Caledon can be found here. As this is a conservation area, we regret that no dogs are allowed on the reserve. N.B. Khoe is more commonly spelt Khoi, but Khoi is the English spelling of the word and the Khoe people prefer the spelling Khoe. Therefore, out of respect, we prefer to use this spelling. Cape Whale Coast, cave, hiking trail, rock art. Bookmark.